This invitation is perfect for the Quinceanera who is a true girl's girl! 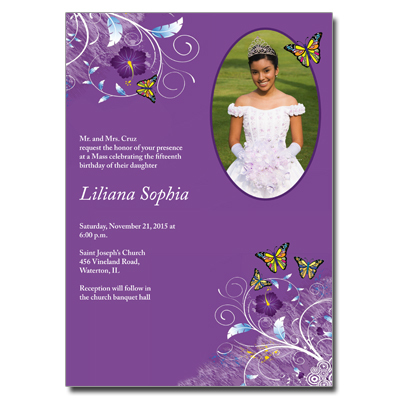 It features the Quinceanera's photo in an oval frame with a butterfly, while purple flowers, blue vines and more butterflies accent opposite corners of the invitation. The background is purple with the celebration details printed in white. Card measures 7 x 5.